With the three cities spread over a distance of 40km, a car can be useful although the public transport options means a car is not necessary. There is a local train service which links the three cities as well as trams (in Gdansk) and buses in each to help you get about. Travelling between the three cities of Gdańsk, Gdynia and Sopot is a cinch, and best done using the SKM kolejka (commuter train). These yellow and blue trains run more or less every 10-15 minutes between 05:00-19:00 through the Tri-city and less frequently outside of these hours with trains also running occasionally between 00:00 and 04:00. Tickets can be bought from modern ticket machines which can be found on most platforms and have instructions in English and a couple of other languages. Alternatively you can buy tickets in main stations where you see the sign for Kasa Biletowa or as a last resort from the conductor at the front of the train for a higher price. If you buy tickets from the Kasa Biletowa make sure that you stamp them with the time in the bright yellow boxes on or close to the platform to validate them. Ticket prices are dependent on the number of stops you are travelling but a journey from Gdańsk to Gdynia will cost 6.20zł and take about 35 minutes (Sopot will cost 4.20zł and take about 20 minutes). Bikes travel for free and should be carried in a specially marked carriage usually at one end of the train. Children under 4 travel for free although you also have to buy a 0zł ticket (we kid you not) and you are likely to be requested to provide proof of the child‘s age so basically keep passports on you at all times. ISIC cards will get you a student discount but only if you're a Polish student, while Euro 26 cards are not valid. You will have to pay a fine if caught travelling without a validated ticket by one of the plain clothes inspectors. (ZKM/ZTM) can also zip you around the relevant cities. Tickets are issued by Gdańsk and Gdynia. Gdańsk tickets allow you to travel in Gdańsk (and Sopot) and Gdynia tickets allow you to travel in Gdynia (and Sopot). If buying a ticket in Sopot you will need to buy a ticket for the direction you are heading i.e. Gdańsk or Gdynia. Tickets can be bought from kiosks or an increasing number of ticket machines which have English and German language options. If you‘re planning on staying longer then there is the Metropolitan ticket which gives you travel in the cities for 24 hours - the first type covers SKM local trains and then buses, trolleybuses and trams in EITHER Gdansk or Gdynia and costs 20zł (10zł reduced) or a second version which is all travel in all 3 cities at 23/11.50zł. These are available from SKM and ZTM points not the machines. 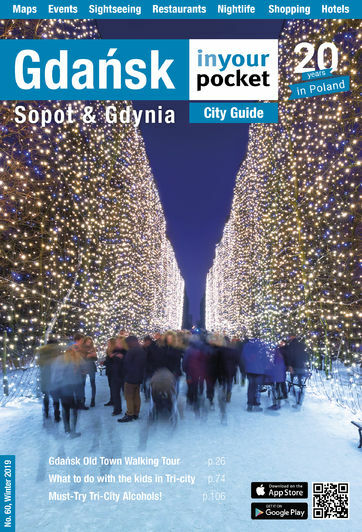 A recommended way to avoid having to decide on which ticket and then having to negotiate how to get it with the woman in the kiosk is to pick up a Gdańsk – Sopot – Gdynia Plus tourist card. As well as the discounts and free entry to many of the sights that the card brings, you will also be entitled to free travel on the whole Tri-city transport network. Pick it up at the tourist information points around the city. Those looking to spend a little longer here might want to consider picking up one the local travel season tickets which includes one - the Metropolitan Card - which allows you to access transport services throughout the whole metropolitan area. If you are looking to travel out of the city you will need to use the national PKP (trains) or PKS (bus) services. For trains you find arrival (Przyjazdy) and departure (Odjazdy) times marked on a board in the main station building with the timetables displayed on A1 size cards (departures on a yellow card and arrivals on a white card). Main line train services run from all three stations in the Tri-city as well as Gdansk-Oliwa and Gdansk-Wrzeszcz. Regional and national bus services (such as services to Frombork) run from Gdansk Bus Station which you will find perched on the hill overlooking the train station.The bus station can be reached via the tunnel entered via the stairs outside the main train station and KFC. Although most taxis are now trustworthy with honest meters, there are still certain drivers who will quite happily take advantage of your ignorance and overcharge for journeys. To guard against this ensure that you use a taxi which is clearly marked. The firms listed below are all reliable with Neptun being the only firm allowed to sit outside of the airport terminal building. Look out for 19686 on the sides of their cabs. Taxis are slightly cheaper if called in advance. If calling one of the abbreviated numbers such as 19686 please be aware that you may need to prefix it with 58 if calling from your mobile. And now a small warning. Because each of the cities are independent when it comes to taxis the driver is allowed to put the meter to the higher tariff when he leaves Gdańsk. That means if you are travelling from Gdańsk to Sopot or Gdynia the tariff increases at the Gdańsk/Sopot border. This can make a difference to the fare between Gdańsk and Gdynia because the Gdańsk taxi will spend more time in his own city and therefore at the lower tariff. A taxi from Gdańsk to Gdynia will cost around 80zł whereas a taxi in the other direction will cost around 100zł as the Gdynia taxi will be spend more of the journey outside of its own city. Poland remains one of Europe’s leading nations in road fatalities, a statistic that will surprise few who have had the pleasure of using the roads here. While the issue of poor roads is being addressed the sheer size of the network means this is still a problem particularly when travelling outside of and not between major cities. The biggest problem though is dangerous drivers resulting in the common sight of mangled wreckages of cars around the country. Yes, the crosses you see beside roadsides are there to mark fatal crashes. While we do not advise against driving in Poland, where new roads and driver education programmes are making driving here less fraught, we do wish to make a number of points clear to the foreign driver. Firstly, when driving outside of built-up areas you will often find yourself sharing a single lane road with all kinds of vehicles going from high-performance saloons to smoking rust buckets. Throw in the huge fleet of lorries that traverse Poland and you will commonly find yourself in a situation where traffic is blocked behind said lorries/banger. This results in frustrated/impatient drivers overtaking each other at high speed and then braking sharply to avoid oncoming traffic. Be warned and keep a safe distance between you and the vehicle in front. Secondly beware of the hard shoulders of these roads, the vast majority of which are unlit at night. These are often used as pavements by local people who add to the Russian roulette by venturing out at night wearing their darkest clothing. Add in the odd drunk on a bike and these hard shoulders become a very real problem when facing a set of headlights bearing down on your vehicle. For those brave enough to venture out the following information should be noted. Poland has strong drink driving laws: 0.2‰ is the maximum blood/alcohol limit, so forget about having even a single beer. EU citizens may use their home driving licences as long as they are valid, however citizens of countries that didn’t ratify the Vienna Convention (tsk, tsk Australia and America) will find their licences invalid (though that hasn’t stopped anyone we know from driving their girlfriend’s car). Carry your licence and passport at all times when driving and make sure you have the car’s documentation with you. The speed limit is 50km/hr in cities (60km/hr between 23:00 and 05:00), 90km/hr outside urban areas, 120km/hr on dual carriageways and 140km/hr on motorways. All cars are required to carry a red warning triangle, first aid kit, replacement bulbs and a national identity sticker. It is compulsory to have headlights switched on at all times. All most travellers need to rent a car in PL is 18 years of age, a credit card (not debit), and a valid foreign driver's licence. Be aware, however, that those from countries that didn't ratify the Vienna Convention on Road Traffic (United States, China, Australia...) cannot legally drive on their home licences; technically an International Driver's License is required in those cases (in the US these are issued by AAA for a fee). If you don't have a license in line with the Vienna Convention, or the required IDL, you may be denied the ability to drive a rental car. Though some car rental companies (the dodgier ones) will still rent you a car (since it's good for their business to ignore international law), be aware that you are assuming full liability if you get behind the wheel; not only can you get a citation from the police, but if an accident were to occur, you would be fully responsible for any damages, regardless of the circumstances. If you're looking to leave the country in your rental car, be aware that you can't cross the borders into Ukraine, Belarus or Lithuania in a rental car. One of the quickest, most comfortable and most modern ways to get around Poland in this era of rail improvements is by coach or bus. There are many local bus services but the national bus business has been cornered in recent years by Polskibus. Water trams (basically ferries) sail during the summer season departing the stop in front of the Hilton in Gdansk. Tickets for the Gdansk-Hel ferry involve a 500m round-trip walk to the inconsiderate ferry company’s ticket booth on the quayside next to the Green Gate. Tickets for ferries F5 and F6 can only be bought on-board. Note that on routes F1 and F3 sailings marked R are subject to demand and will only go if there are enough passengers. If you'd like a form of motorised transport to get around the city, there are now a few self-drive options available which will allow you to pick up a vehicle from the street, drive to wherever you want to go and pay for it via an app. Check these out for a start.